He’s aged enormously between ’97 and October of last year. This is a man who was clearly not well. I mean, as you see from these pictures here, he’s really, by December he’s looking pretty terrible. But by December, of course, that tape that was aired then, he’s barely moving the left side of his body. So he’s clearly got diabetes. He has low blood pressure. He’s got a wound in his foot. He’s apparently got dialysis … for kidney problems. I mean, this is a man who has a number of health problems, apart from the fact that anybody running around the Afghan mountains is not going to be in great shape. Two months before September 11 Osama bin Laden flew to Dubai for 10 days for treatment at the American hospital, where he was visited by the local CIA agent, according to the French newspaper Le Figaro. The disclosures are known to come from French intelligence which is keen to reveal the ambiguous role of the CIA, and to restrain Washington from extending the war to Iraq and elsewhere. Bin Laden is reported to have arrived in Dubai on July 4 from Quetta in Pakistan with his own personal doctor, nurse and four bodyguards, to be treated in the urology department. According to Le Figaro, last year he ordered a mobile dialysis machine to be delivered to his base at Kandahar in Afghanistan. In addition, it is rumored that Bin Laden had Marfan Syndrome – a disorder of the connective tissue, which usually shortens the life span (Abraham Lincoln had Marfan). 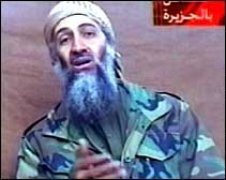 Judging by photos and the FBI’s physical records, Osama bin Laden could be a candidate for the diagnosis. He is said to be between 6 foot 4 inches and 6 foot 6, which is apparently unusual for his family. He is thin, bony and has little muscle; he weighs only 160 pounds. And he uses a cane — possibly the result of connective tissue or back problems. Other information about the leader of al-Qaida suggests he may have a heart condition. His facial structure also resembles that of people with Marfan. David K. Schenker, a research fellow at the Washington Institute for Near East Policy, agrees that bin Laden’s size is atypical for his surroundings. “I lived in the Middle East, and I never ran into anyone that tall,” he says. The guy in the newly-released videos looks healthier than Bin Laden actually looked 9 1/2 years ago, even though he sustained injury in Tora Bora, was on the run for a while, and then was holed up inside a house for years. The Bin Laden looks better in the new video than in the age progressed image in 2010 … and much better than he actually looked in 2001. Am I saying that it’s not Bin Laden? Not necessarily, although the CIA has previously admitted that it made fake Bin Laden videos. But if it’s Bin Laden, it’s from a long, long time ago.